Question: How do the Spanish language outlets stack up in the news ratings here in D-FW? I know that in Los Angeles, the Univision facility routinely beats several of the English language newscasts head-to-head. 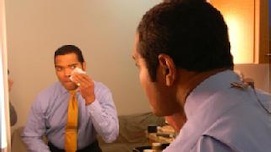 Answer: In the last full ratings "sweeps" period, May of 2010, Univision's Noticias 23 again fared quite well in head-to-head competition at 5 and 10 p.m. opposite the four major English language newscasts. Noticias 23, which airs on KUVN-TV, ran third in total viewers at 5 p.m., beating both Fox4 and CBS11. And it was No. 1 at that hour with 25-to-54-year-olds, the main advertiser target audience for news programming on most stations. In the 10 p.m. Nielsens, Noticias 23 outdrew Fox4 and NBC5 in total viewers and again finished first among 25-to-54-year-olds. Telemundo's Spanish language newscasts were not a factor in either time period. Question: What happened to the Channel 8 digital channel called THIS? I was really enjoying watching Highway Patrol and Sea Hunt at four in the morning when I couldn't sleep. And all the '80s movies were a lot of fun, too. I can't find anything about THIS anywhere. Answer: Dave Muscari, vice president of strategic alliances for WFAA8, sends this response: "Success on television is often measured by viewership, and/or other business economics. In the case of THIS TV on WFAA3, it did not have what was needed to sustain it." Many cable systems, or Verizon Fios in my case, do not carry the extra WFAA digital channels. So I never saw THIS, and now never will. Addendum: A faithful over-the-air broadcast TV watcher notes that THIS will re-emerge on Dec. 6th, and be carried on KDAF's Ch. 33-3 in D-FW. And in January, another non-cable channel, Antenna TV, will launch on KDAF's Ch. 33-2. It also will mostly air "Classic" TV, meaning old reruns and movies from various vaults. Maybe cable or satellite isn't that great after all. Question: What happened to poor Baron James, who used to be on Channel 4? My daughter said to ask you. I wasn't a huge fan of his, but thought they did him wrong. Answer: Baron James anchored for a decade at Fox4 in Dallas before the station decided not to renew his contract in November of last year. 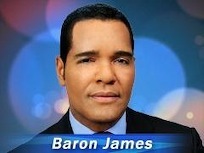 He left the station in January and since has landed at WPLG-TV, the ABC station in Miami. He's both anchoring and reporting, and seems to be quite happy about it. "I thank God I'm at Local 10 news to work my tail off for you," James says in his official station bio. "My philosophy is that news should be informative and balanced -- not all bad news -- but good news too, more of a true reflection of the lives we live or aspire to live." James also tells his South Floridian viewers, "I hope to see and meet you as I passionately volunteer my energy, heart and hands with charitable and other non-profit groups to serve our many diverse communities."